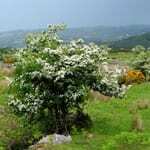 You may find many single hawthorns on farmland. Farmers sometimes won’t cut them down. They believe it is bad luck to do this. These trees were under the protection of fairies and, if the ‘fairy tree’ was killed, the fairy might seek revenge. The leaves are ‘alternate’. They are up to 6cm long, have 5-7 deep lobes and teeth on the leaf tip. The stipules are at the base of each leaf. The new shoots are fresh green, darkening later. The underside of the leaf is light green. The flower is white and has a single pistil and 5 petals. It is similar to the wild cherry flower (they are from the same family). Sometimes the tips of the petals are pinkish. 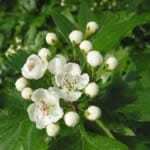 The flowers appear in May, giving the hawthorn another name – maythorn. The fruit, or haw, is dark red with one seed. They remain on the branches until the following spring (unless they are eaten). They are important winter food for birds like dunnocks, blackbirds, thrushes and bullfinches and some of our winter visitors like redwings. They can provide food for humans as well and together with flowers have medicinal use – they are good for your heart. 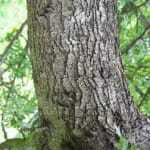 The bark is greyish brown and has a lot of small scales. In the nooks and crannies of the bark you might find a lot of insects and tiny plants making their home. 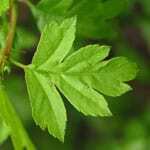 Take a closer look next time you come across a hawthorn. 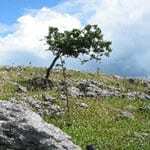 Hawthorn is a very undemanding tree and grows almost anywhere, in rock crevices and other unreachable places. It is the most common tree or shrub planted in hedges. 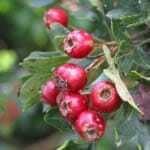 Over 200 plant-eating insects depend on hawthorn. The ecological value of the tree is very high because it provides protection and food for many animals.